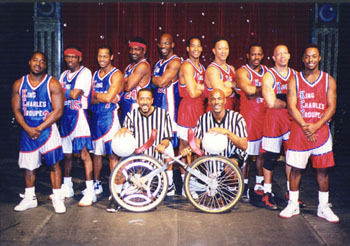 The King Charles Troupe is a group of young men out of the Southeast Bronx,who display an unbelievable game of high-extreme basketball on unicycles. One man's idea utilizing a unicycle as a tool to keep kids involved in something decent and constructive. Jerry King became an inspiration to his neighborhood by forming a unicycle club as a community project. The Troupe exhibits skills ranging from slam-dunks, dribbling, passing, jumping rope to acrobatics. They'll keep you on the edge of your seat with their hilarious high-jinks and comedic antics. Their extraordinary riding ability and world-class skill never cease to excite audiences of all ages.